Two lamprey species are native to the Coos system, yet very little is known about their abundance, distribution, or life history. Two lamprey species, the western brook lamprey (Lampetra richardsoni) and Pacific lamprey (Entosphenus tridentatus formerly Lampetra tridenta), are native to the Coos estuary. Like most non- commercial species, the status and distribution of lampreys have not been the focus of research in the Coos estuary. Therefore, all available information comes from incidental catch data obtained during investigations of other fish species. Although data have not been collected specifically to quantify Coos estuary lamprey populations, anecdotal evidence suggests a decline in Pacific lamprey abundance along the entire Oregon coast during the past 30-40 years (ODFW 2005). Since 2002, Pacific lamprey presence has been documented by the Oregon Department of Fish and Wildlife (ODFW) while conducting salmonid population research in the South Slough’s Winchester Creek. They counted 43 adults in 2002 but only one in 2006 and 2007 (Suring et al. 2012)(Figure 1). ODFW also caught hundreds of ammocoetes (juveniles) each year from 2002-2007. However the counts did not differentiate between the Pacific and western brook lamprey. Eyed lamprey, the life stage between juvenile and adult, were also recorded, with a range of over 1,500 individuals in 2006 to a low of two in 2010. Pacific lamprey have also been found during ODFW’s annual steelhead surveys in other areas of the Coos estuary system. Kavanagh et al. (2005) examined fisheries information for the Elliot State Forest study area and reported no lampreys or lamprey redds (gravel “nests”) during winter surveys in 2003. In 2004, however, one adult and 9.2 redds per mile were documented in Palouse Creek. Three adults per mile were also recorded for the West Fork Millicoma River, along with 43 redds per mile. However, redds are a poor indicator of lamprey abundance, because lampreys create redds during courtship that are never used, and Pacific lamprey redds are easily confused with steelhead redds (Kostow 2002, Gunckel et al. 2006). 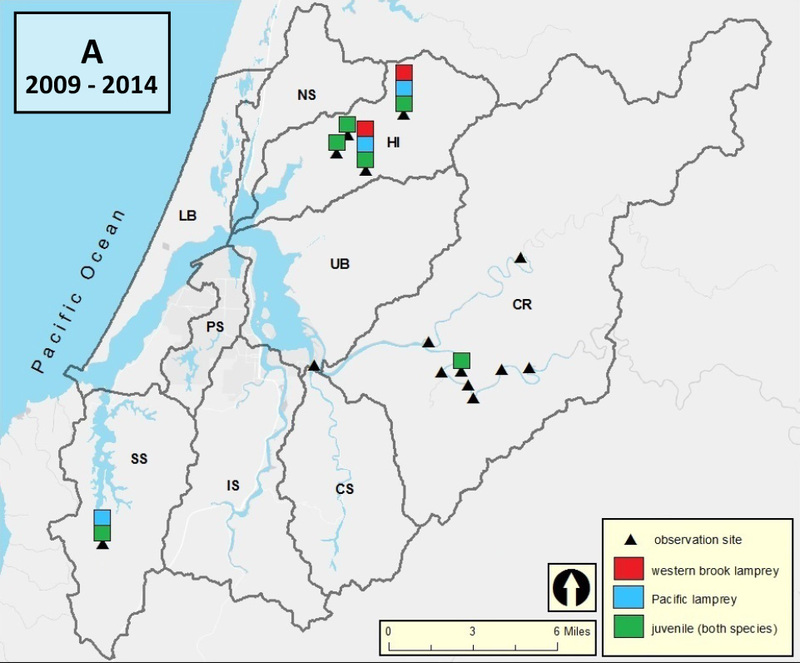 Incidental catches of adult and ammocoete Pacific lamprey were recorded in Larson and Palouse Creeks (Haynes Inlet drainage basin) by Coos Watershed Association (CoosWA) researchers during annual salmon life cycle monitoring, which began in 2005 (Figure 1). Roughly 1-5 adult Pacific lamprey were found in Larson Creek most years, but were only occasionally found in Palouse Creek. Ammocoetes were more abundant in the Larson system and not differentiated by species. CoosWA also found other ammocoetes and adult western brook lamprey in Larson and Palouse Creeks during the same Coho lifecycle monitoring surveys (Figure 1)(CoosWA 2012). Western brook lamprey adults were found in moderate numbers (~50) in the Larson system and low numbers (~5) in Palouse Creek. Pacific lamprey ammocoete and adult counts were combined, and ammocoetes were captured in higher numbers in the Larson system. Western brook lamprey have also been found in low densities in the South Slough watershed, and are often associated with beaver ponds (Rumrill 2002). In the Coos River, annual ODFW seining has collected Pacific lamprey adults and ammocoetes as recently as 2011 (Figure 1)(ODFW 2013). In nearby basins: Data from the Winchester Dam on the North Umpqua River show lamprey abundance began declining rapidly in the early 1970’s and remained low (Kostow 2002). Gunckel et al. (2006) noted that Pacific lamprey only occupied large mainstem reaches of the Smith River. 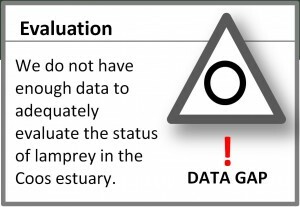 The same distribution was observed by Brumo (2006) in the Coquille River. A short-term study in the nearby Tenmile Creek estimated approximately 6,500 Pacific lamprey migrated to the ocean in 1994 and about 3,500 in 1995, indicating a healthy but highly variable population (van de Wetering 1998). In the Umpqua watershed’s Smith River, Gunckel et al. (2006) found that western brook lamprey were widespread in smaller-order tributaries, an analysis based partly on redd surveys. However, as with Pacific lamprey, population estimates for western brook lamprey based on redds are less accurate than counts because: redds are sometimes too close together to distinguish; redds can be confused with elk tracks, therefore should not be counted unless adults are also present; and western brook lamprey sometimes spawn in redds already created by Pacific lamprey (Gunckel et al. 2006). 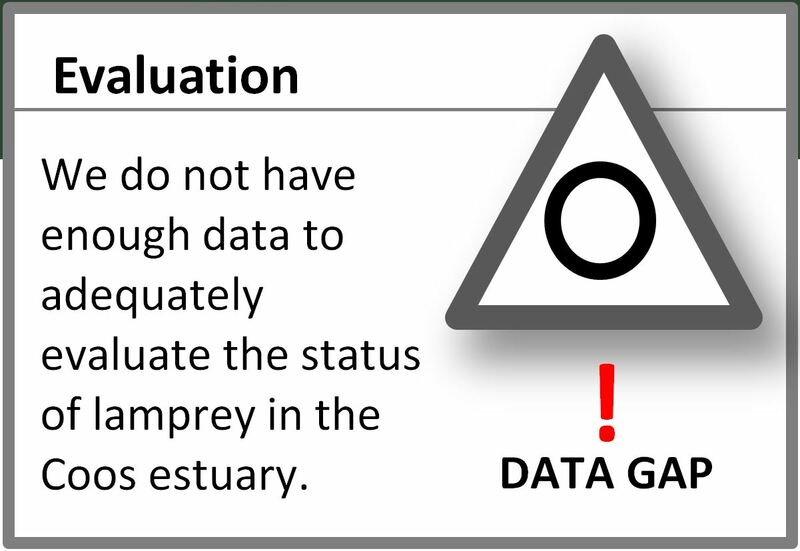 Despite the lack of quantitative western brook lamprey population data, ODFW (2005) speculates that their numbers and distribution are declining, most likely due to habitat loss and pollution. An anadromous species, adult Pacific lamprey require freshwater creeks with sand and gravel bottoms for spawning while juveniles require low velocity freshwater side channels with soft sediments for burrowing (Kavanagh et al. 2005). Juveniles remain burrowed four to seven years before emerging and migrating to the ocean, where they spend another two to three years as parasitic adults before returning to their natal streams to spawn (Close et al. 2002). Pacific lamprey are federally listed as a “Species of Concern”, and state listed as “Imperiled in Oregon” (ORBIC 2013; ODFW 2006). Pacific lamprey are harvested as a subsistence food by Native Americans and have high cultural value for several Oregon Tribes. In fact, the Coquille Tribe name may mean “eel”, a reference to lampreys (Byram 2002). In contrast with Pacific lamprey, western brook lamprey spend their entire lives in fresh water and probably remain close to their natal streams (ODFW 2005). Western brook lamprey ammocoetes spend up to 6 years burrowing in the fine sediments of slow-moving streams. Upon emergence, they are sexually mature and stop feeding; about 6 months later they spawn and die (Gunckel et al. 2006; Kostow 2002). Western brook lamprey are currently ranked by NaturServe as globally “apparently secure” but in Oregon they are considered a species at risk (Santos et al. 2014). ODFW lists them as “Sensitive or vulnerable” (ORBIC 2013; ODFW 2006). Degradation of spawning and ammocoete habitats is likely the main cause of declining lamprey populations. Degradation can include: dewatering of stream reaches, which strands burrowing ammocoetes in exposed substrates; impediments to passage (e.g., incorrectly installed culverts); reduced water quality (e.g., higher water temperatures); stream bottom dredging (e.g., mining activities); and predation by non-indigenous species (e.g., striped bass)(USFWS 2010). Ammocoetes are particularly vulnerable to these habitat changes. Brumo, A. F. 2006. Spawning, larval recruitment, and early life survival of Pacific lampreys in the South Fork Coquille River, Oregon. [MS Thesis]. Oregon State University. Byram, R. S. 2002. Scoquel, Coquelle, and Coquille. In Ivy, D. B. and R. S. Byram (eds.). Changing landscapes: sustaining traditions. [Proceedings of the 5th and 6th Annual Coquille Cultural Preservation Conferences]. Coquille Indian Tribe. North Bend, OR: 121–138. Close, D. A., M. S. Fitzpatrick, and H. W. Li. 2002. The Ecological and Cultural Importance of a Species at Risk of Extinction, Pacific Lamprey. Fisheries 27(7): 19-25. Coos Watershed Association (CoosWA). 2012. Coho life-cycle monitoring program. [Unpublished raw data]. Gunckel, S. L., K. K. Jones, and S. E. Jacobs. 2006. 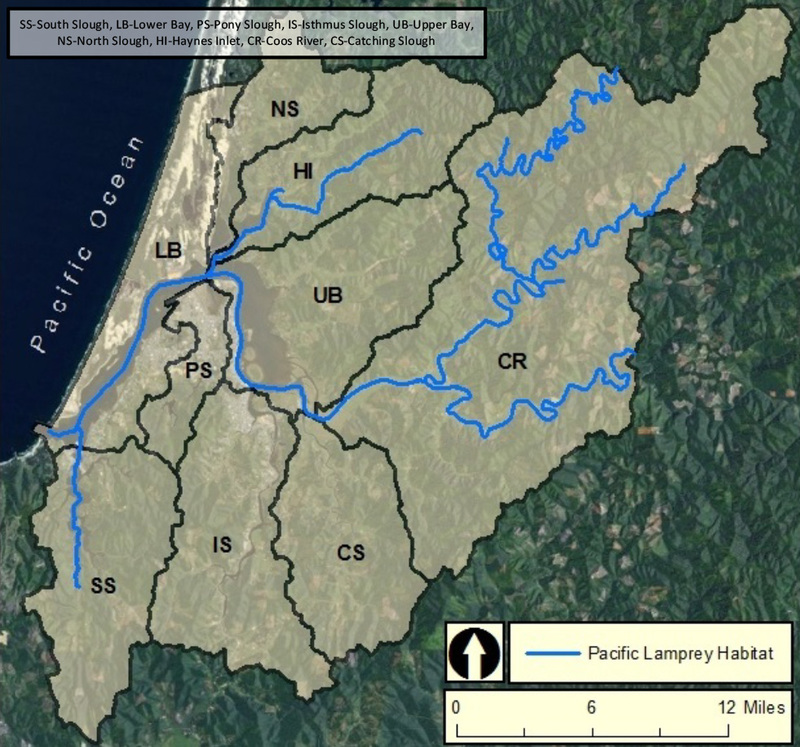 Spawning distribution and habitat use of adult Pacific and western brook lamprey in Smith River, Oregon. Oregon Department of Fish and Wildlife. Corvallis, OR. Kavanagh, P., K. Jones, C. Stein, P. Jacobsen. 2005. Fish Habitat Assessment in the Oregon Department of Forestry Elliott Study Area. Oregon Department of Fish and Wildlife. Corvallis, OR. Kostow, K. 2002. Oregon lampreys natural history, status, and problem analysis. Oregon Department of Fish and Wildlife. Salem, OR. Oregon Biodiversity Information Center (ORBIC). 2013. Rare, Threatened and Endangered Species of Oregon. Institute for Natural Resources, Portland State University. Portland, OR. Oregon Department of Fish and Wildlife (ODFW). 2013. Coos fish monitoring seine program. [Unpublished raw data]. Rumrill, S. 2002. The Ecology of South Slough Estuary: Site Profile of the South Slough National Estuarine Research Reserve. National Oceanic and Atmospheric Administration. Charleston, OR. Suring, E., R. J. Constable, C. M. Lorion, B. A. Miller, and D. J. Wiley. 2012. 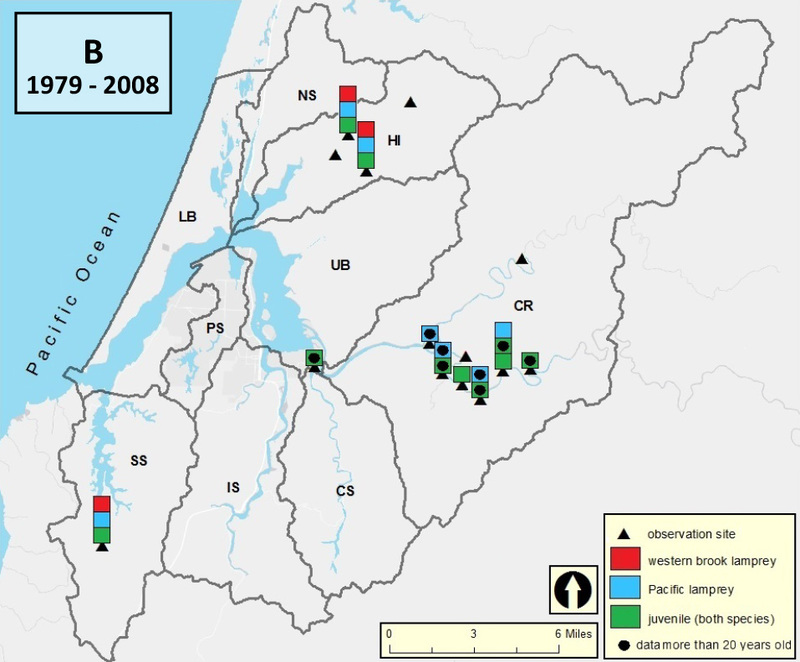 Salmonid Life Cycle Monitoring in Western Oregon streams, 2009-2011. [Monitoring Program Report Number OPSW-ODFW-2012-2]. Oregon Department of Fish and Wildlife. Salem, OR. van de Wetering, S. J. 1998. Aspects of life history characteristics and physiological processes in smolting Pacific Lamprey, Lampetra tridentata, in a central Oregon coast stream. [MS Thesis].